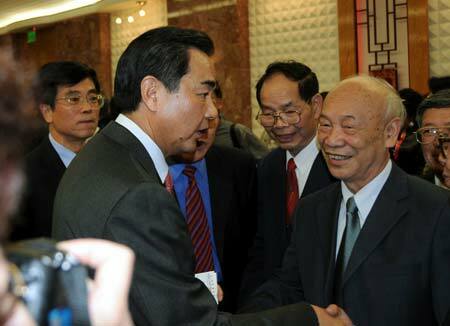 Wang Yi (L front), chief of the Taiwan Affairs Office of the Chinese State Council, greets the overseas Chinese in San Francisco, the United States, June 18, 2009. Wang Yi said here on Thursday that the mainland will focus on economic, cultural and educational cooperation as well as people-to-people exchange with Taiwan in a bid to further promote cross-Strait ties. SAN FRANCISCO, June 18 (Xinhua) -- Visiting chief of the Taiwan Affairs Office of the Chinese State Council, Wang Yi, said here on Thursday that the mainland will focus on economic, cultural and educational cooperation as well as people-to-people exchange with Taiwan in a bid to further promote cross-Strait ties. The Chinese mainland will enhance and deepen economic cooperation with Taiwan in a bid to jointly cope with the current international financial crisis, Wang said at a reception for overseas Chinese. 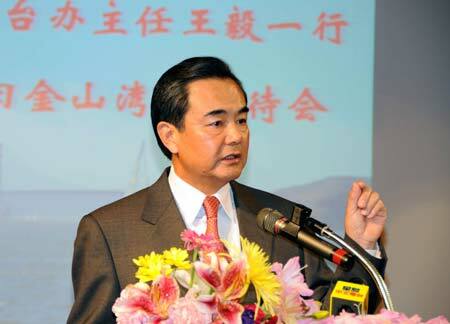 Wang Yi, chief of the Taiwan Affairs Office of the Chinese State Council, speaks at a reception in San Francisco, the United States, June 18, 2009. Wang Yi said here on Thursday that the mainland will focus on economic, cultural and educational cooperation as well as people-to-people exchange with Taiwan in a bid to further promote cross-Strait ties. The two sides will vigorously expand cultural and educational cooperation, and broaden exchanges between the people across the Taiwan Straits, Wang said. He pointed out that two things should be borne in mind in the process of pushing forward the cross-Strait relations, one is to follow the principle of addressing easy issues first while leaving difficult problems for later. The other, is to keep on cementing and deepening the political mutual trust between the two sides, with the key point of both sides insisting that the mainland and Taiwan belong to one China. Wang reiterated that the Chinese people across the Taiwan Strait should not only seek common ground while reserving differences, but also try to "gather the common while resolve the differences." The recent progress of cross-Strait relations has proved that the peaceful development of the relations will benefit both sides and suit the common interests of the mainland and Taiwan people, Wang said.